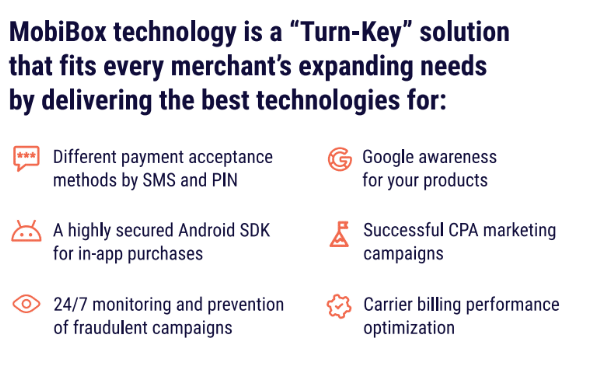 Our solution offers merchants to list their VAS services in our Market Place to have users acquisitions via one friendly mobile application with mobile CPA campaigns in more than 50 GEOs (40+ mobile carriers in the GCC and MENA region). Mobile Arts has built this new concept as the perfect choice for merchants who have Web services with a carrier billing service and wish to convert their services to IN-APP subscription method. The concept behind VAS Master is to enable different mobile subscription methods (PIN or SMS activations) easily and fast without stopping CPA campaigns. This power of diversity allow merchants to decide easily which subscriptions method fits best for their services and helps which method can give a better a revenue growth per GEO and Carrier. VAS Master Solution is the right choice for merchants to start safe Advertising and launch fast In-app subscription in new markets.